I hope many of you are getting ready to enjoy a long weekend! I wanted to share part 2 of my Blairsden Mansion recap, again focusing on the details rather than the full room. If you missed "Part 1" check it out here! Let's begin with fellow Interior Redecorator Susan Hayes! Congratulations! I was so excited to see Blairsden Mansion last weekend with my mom! If you haven't heard me mention Mansions in May before it's an event hosted in Morris County NJ every 2 years by the Woman's Association of Morristown Medical Center. The fundraising efforts this year went to two great causes: to expand the Pediatric Intensive Care Unit, and the New Autism Center. Not only is it a great cause to support, but it helps showcase designers in the area, help build their portfolio, and is a fun way to try new things! It was very competitive to get a room this year and so it's even more exciting for those who got one! So for this post I thought rather than show photos of the entire room (which is very hard to do) it would be fun to show a few details that I found beautiful or interesting. Not only are the architectural details of the mansion stunning, but the way each decorator styled their room is beautiful. These small details are things you can apply to your own home to add more interest. There were 52 rooms in the mansion so I will break the posts into two parts. So without further adieu in the order of the tour.... post number one! Check out the carved details above!! Table vignette #11 by Hope Sferra Interiors Inc. I was excited to attend an event at Creative Wall Coverings just about 2 weeks ago where I saw a rep from Sanderson present some truly stunning new product. Each wallpaper and matching fabric was more gorgeous than the next and it had us all swooning. The textures and metallics were fantastic and exciting, and the children's line called "All About Me" by their Harlequin brand was just charming. It was so charming in fact that I even decided to create my very first moodboard to share with you here! I usually create a board to share privately with my clients, but after seeing sample boards at CW&I and being inspired by these patterns I thought I'd give it a whirl even though there is no particular client for the board. I decided to start with their Kaleidoscope pattern since I thought the geometry and colors were fun and generally gender neutral. There are several colorways for each pattern too, so make sure you see them all! The concept here is a contemporary nursery that could go mid-century. Since the wallpaper is so colorful and gorgeous, we'll let it steal the show and do all the heavy work by putting it on one main wall. By consolidating the pattern (as opposed to an entire room) it will keep the room from looking too busy and will provide a great backdrop to build upon. In front of the wallpaper we'll use white furniture that will really pop in front of all those colors. On the opposite wall we'll bring in some of the colors from the paper with smaller accessories. Depending on gender you could use more pink or blue accessories, but the use of the yellow & orange really works well too. The format above is similar to Olioboard that layers each item for a more realistic look with consideration to scale. The other option shown below is a cleaner grid format that lets each product have it's own space. Here are some other favorite "All About Me" fabrics that have been on my mind. It was hard to decide which to work with first! Many times in design the initial concept isn't exactly what becomes the final. In some cases there are minor tweaks, and in others it's a major overhaul. Either way a lot of work goes into each concept even if it's not produced or chosen as the final. Here is an example of a built-in cabinet concept I designed in CAD as a "proof of concept." This was designed based on existing cabinets that were purchased at the Habitat Restore. They would provide a ton of storage along a blank wall while transforming existing bifold doors into sleek, space-saving barn style sliding doors that would disappear behind the cabinets. Here is a video of the cabinet parts and assembly. This is by no means a finished render, but I thought it was fun to show nonetheless! Anyway, once installed they would need to be painted to match the room. One option is to paint the cabinets the same color as the trim, which is a glossy white. This would make the cabinets stand out in the room and blend in with the door and moldings. Below is a section view of the room showing the span of cabinets and a part of the wall on each side. A second option (and what I would recommend for this particular space) is to "paint out" the cabinets the same color as the wall so the cabinets actually blend into the wall and become a subtle architectural detail. Then the door and molding would stand out as a more detailed deep entry into the next room. So what do you think of this built-in cabinet concept? Do you have other custom cabinet needs or ideas?Would love to hear! While Earth Day was officially Tuesday the 22nd of this week, it's always a good time to share some tips to reduce the footprint in our daily lives.These tips are essential information to share on a decorating website where decisions are being made on what to keep, donate, reuse, or recycle. I wrote this article last year focusing on product ideas: Decorating Tips Mother Earth Would Love, and another on America Recycles Day in November. Here are 4 NEW tips & resources to help you reduce, reuse, and recycle. I hope you find some of these helpful in making the right decisions for your home. WOW! I was watching HGTV /DIY Network's Rehab Addict where Nicole Curtis brought gallons of unused paint to a paint store to have them retinted!! Not only was the cost savings significant, but think of all that paint saved just because it was leftover or not perfect for a previous job. Her only tip was to keep the base color in mind, if you have a light base you can work with lighter colors or darken it, if you are starting with a dark base then you'll have to stay with a darker color. I can't wait to try this myself. This is a great tip from C&C Electric, I learned they can replace your existing high hat lights with these retrofit LED bulbs! Not only will they save you electricity, but will outlast a regular incandescent by many years (which are not being produced anymore anyway). I am so glad LED's are on the rise and compact florescents are being replaced. As I'm sure you know they contain mercury which is not only hazardous when broken, but makes them hard to dispose of because a limited number of places take them to recycle. I did find a great local resource for pretty much any type of recycling though so if you are looking to unload some of your old bulbs you can bring them to the recycling center in Roxbury (more info in this link). New flatscreen TV's have become so affordable that it has become hard to give away those old TV's that are more than 2"deep. Same with computers, monitors, printers, cell phones, etc. The problem is these are also terrible for the landfill since they have different parts and components that should be dissected and properly recycled. There is a local resource called GreenVision that accepts anything with a plug and dissects the parts for recycle. Not only are they 99.8% landfill free, they also provide meaningful jobs for developmentally disabled students and adults. Bring your old electronics there! Greenvision Inc. I hope these tips give you some ideas to be resourceful and recycle. Have a great weekend!! HGTV is continually a source of inspiration for anyone looking for creative solutions for their home. I came across this article and wanted to show a few of my favorite before & afters that demonstrate how a little bit of paint can go a long way! These bird sculptures are such a great example of how metallic paint can change the entire look of an object. Everyone has (or has seen) a bazillion of these little collectables, and I've seen this idea before but now in a matching bookend! By painting the object all one color it becomes more interesting to look at the sculptural details rather than the painted ones. I LOVE, LOVE, LOVE this idea! Especially since the days of "matchy-matchy" sets are over, why not go to your local Habitat Restore, or local thrift store and buy a bunch of different wooden chairs! These seats are so easy to DIY reupholster as well. Now they all coordinate but aren't identical so they add some interest to the room and let your eyes wander! Another great way to add a pop of color to a room, especially when wooden bedroom furniture can be so dark and dreary. This pop of pink certainly adds some interest, or why not try a simple white, cream, or black for a neutral option. Well the weekend starts in 3, 2, 1.... go! Hope you all have a wonderful one! Last month I hosted a "Design Dilemma" Q&A session at the Habitat Restore and was happy to help people with those burning design questions on their minds. I helped with several furniture floorplan questions, which I LOVE doing because it creates a world of difference in a home and how you use the space. I also fielded a few DIY questions related to updating furniture & kitchen cabinets. Below are a few other questions with pictures to demonstrate a solution. Q- What type of curtains can I put in a two-story bay window? A- I love the look of straight curtain panels hung on either side of the window and on the inside of each corner. Floor to ceiling this look pulls the room together and adds softness while not competing with the view or being overly complicated. I pulled up an image I had saved to my Pinterest board and she loved it! Q: The brick fireplace in my home is too orange and doesn't match my style. Can I paint it? A: Yes, try a whitewash! While painting is a good option for some homes I have been recommending a whitewash look instead. This takes out the orange/red undertones in the brick and neutralizes them while still showing variations in each brick. This works particularly well with the gray trend that's been going on the past few years. This DIY project is as simple as watering down latex paint and "washing' it on and letting it soak in. Blot off drippy areas, and you can customize how much you want covered. Q: My dining room has a built-in cabinet in one corner, and the room is feeling off balance. Can I paint the inside the same as the wall color? A: This was a great question because balance is so important in a room. My first suggestion would be to add another tall object in the opposite corner, another built-in with more storage that matched the other would be best. If that won't fit then try adding a corner shelf of even a tall plant. The second part of this answer is to try "painting out" the entire built-in. 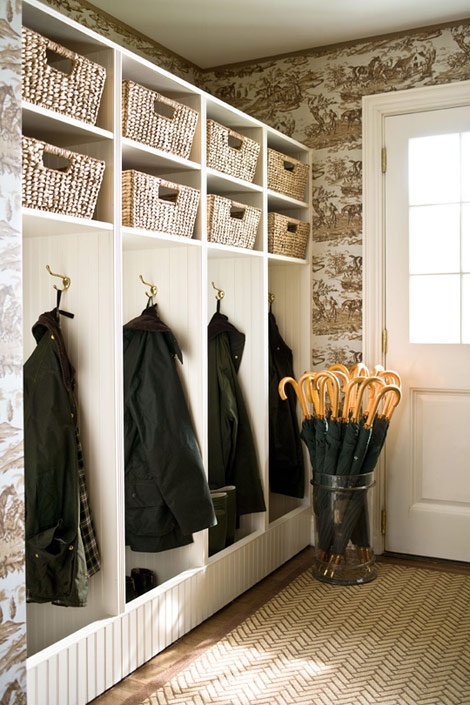 This is a great trick to use in small spaces to make everything seamless and blend in while adding subtle details and of course storage. What questions & design dilemmas are on your mind? 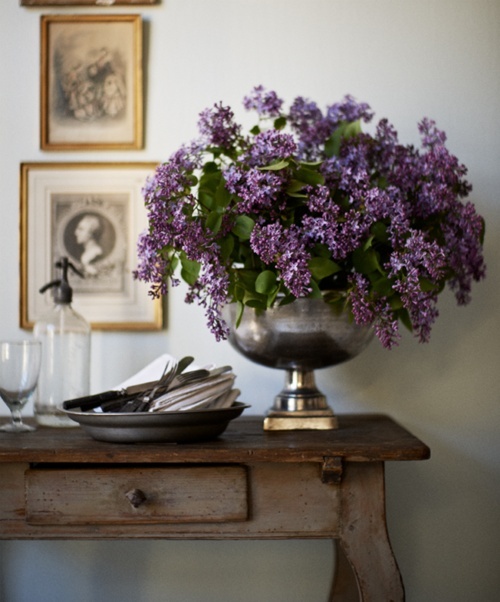 Pretty lilacs via HenhurtInteriorsBlog - I can almost smell them! Rainy days are always good for browsing Pinterest... and for a laugh you should check out "Pinterest Nailed It" for classic Pinterest fails. More here and here, and look in Pinterest itself.